No matter how hard it is to get out the door, it's on the road that we meet our strengths and weaknesses, have the space to contemplate our hopes and dreams and ultimately find what makes us happy. Not every workout is an epiphany. Instead, each time out on the road—no matter how much of a battle it was to get there—is an exercise in getting to know ourselves a little bit better. It’s on that road that we learn our strengths and weaknesses, ponder our hopes and dreams, and ultimately discover what makes us happy. For women who draw even a portion of their strength from being active, Run Like a Girl 365 Days a Year serves as a Book of Days. It's practical, inspirational, and personal, with a dash of the existential and neurotic, it’s a fresh take on the popular thought-a-day books, geared toward women athletes. Containing 365 entries for a full year of running inspiration, Run like a Girl 365 Days a Year revels in the joys we discover as we greet our athletic selves each new day, and confront the obstacles thrown in our way by the world, by our bodies and, most importantly, by our minds. Some of the topics include balance, body image, the battle of the sexes, sisterhood, and aging. 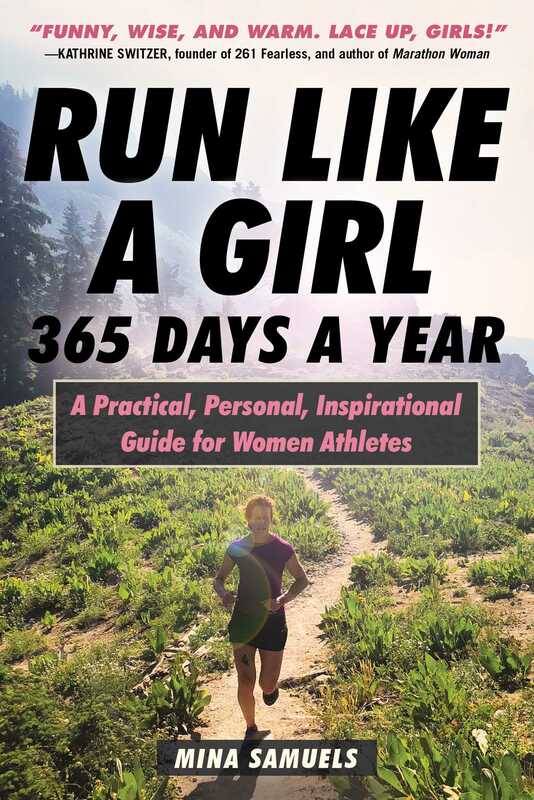 Light-hearted, honest, and authentic, Run Like a Girl 365 Days a Year is an inspiring daily reminder of every woman’s strength and potential. Mina Samuels is a full-time writer, editor, and performance artist, and in a previous incarnation, a litigation lawyer and human rights advocate. Mina's first book, Run Like a Girl garnered a great amount of national press and was featured on The Today Show. She co-authored The New York Times bestseller The Think Big Manifesto with Michael Port, and has been a ghostwriter on several other book projects, including a bestseller with the CEO of a Fortune 100 company. She lives and works in New York City. "As an expressive boy full of joy, my older brother tried to stifle my light. He bullied me by calling me a sissy and saying, 'you run like a girl.' In life, hidden in the forces that pull us down is the energy to lift us up. In retaliation, I learned to flip and fly, moving faster than anyone around me. Mina brings new meaning to that phrase with her insightful and masterful book Run Like a Girl 365 Days A Year. Her physical, mental and spiritual journey align with both truth and humility. If running like a girl means pursuing this marathon called life with the same awareness as Mina, then in her writing she gives to all of us a fresh pair of running shoes." ?Christopher Harrison, Founder AntiGravity Inc.